Canada is home to 25 per cent of the world’s wetlands, which are important for the health of Canada and the health of our planet. In Manitoba, we see proof all around us. From Lake Winnipeg, to the prairie potholes, wetlands are crucial ecosystems that must be conserved. However, these ecosystems are disappearing very quickly due to habitat loss, invasive species and pollution. Every day, important wetlands are being lost across Canada. Since 1900, over 64 per cent of the world’s wetlands have been lost, with nearly 50 per cent of this loss happening since 1970. Here in Canada, we have seen wetlands disappear in the places where we need them the most. In Manitoba, with so much of our province covered by water, we have an opportunity to conserve. As we lose these places, we also lose both nature and the crucial ecological services that healthy wetlands provide. Many wildlife species rely on wetlands. They provide vital nesting and feeding grounds for waterfowl and many other animals. When wetlands disappear, species that depend on these habitats have nowhere else to live. Some species become endangered, or no longer occur in Canada. Wetlands are disappearing so fast that urgent action is needed to conserve the ones that are left. Wetlands are among the Nature Conservancy of Canada’s (NCC’s) most important habitats that we are working to conserve. We also work to restore wetlands that have been degraded, to improve these natural spaces for migratory birds, amphibians, fishes and other wildlife. NCC has protected wetlands across the country for the benefit of wildlife and people for over 55 years. Through the development of Natural Area Conservation Plans, we identify areas that most urgently need conservation. We then partner with private landowners, communities, governments and other organizations to conserve these important habitats — including wetlands, floodplains and shores. To date, NCC has secured over 379,000 acres (153,375 hectares) of habitat for migratory birds and other wetland species under the North American Wetlands Conservation Act. Wetlands play an important role in the health of our country and our communities. They play a critical role in absorbing and storing carbon. They also remove sediments, excess nutrients and even bacteria from our drinking water. Like a giant paper towel, they absorb and hold water to buffer our cities and farms from floods and droughts. In addition to their importance for nature, many of NCC’s wetland areas inspire Canadians to connect with nature. Wetlands provide recreational opportunities, such as walking, hiking, fishing, wildlife viewing and canoeing, along with educational opportunities, for people of all ages to learn and explore. 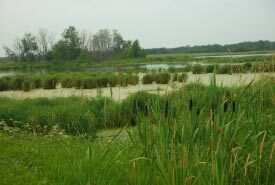 The federal government has been an important partner of NCC and other conservation groups in helping preserve wetlands, through the Natural Areas Conservation Program. By encouraging this investment in nature, we can protect vital habitat and services that wetlands provide to Canadians. Canada has committed to protecting 17 per cent of its land and inland waters by 2020. We need to focus this conservation on the places that matter the most for nature and matter the most for people. Private land conservation helps both by conserving places that are important for species protection and for local communities. Each of us can help Canada be a world leader in saving wetlands, helping address climate change and build a natural legacy for our children and grandchildren. By supporting conservation efforts and sharing your thoughts with friends and various levels of government and the business community, you can help make every day a wetlands day.